The Best Live Shows of 2007: Did They Really Matter to Us? I’m always curious to know if the live shows others are raving about intersects with what I’ve enjoyed. And when it does I like to know what exactly that means. So I’ve complied a brief sampling of some of the best in show of 2007 from Popmatters, Chicago Tribune’s Greg Kot, Chicago Sun-Times Jim Derogatis, Pitchfork Media, Stereogum, Concert Live Wire, and others across the US. These lists and pictorials make me wonder why certain magazines/websites decide to go with just a pictorial and ditch the lists or how the editors go about deciding whether to loop in the readers or leave them on the outside waiting to match and compare from the other side of the computer screen. In an indie vs. Major label standoff, The Plug Independent awards have their own list just for independent labels, venues and media outlets so there’s some obvious reasons for separating the majors from the minors or the commercial from the artistic or the elitist from the populist. And when it comes to the live show, Plug gets extensive with three categories to rank live music; the best live act, the best music festival and the best music venue. But what exactly does that say about the impact of the live show and how complex of an experience it really is? It says a lot. Live music is crucial to our existence. And beyond comparing the lists, and seeing what live acts were enjoyed the most, gathering up this brief list was also fun because it revealed some of the choice ways a live show can be taken in, critiqued and remembered long after the show is over. From the newspapers to websites to blogs all music writers (and some fans)displayed their most memorable live moments via slide show pictorials, straight to the point lists with a few comical approaches tossed in. It’s no secret that a live show can change your life and since we creatures of the live show are complex beings and a live show wouldn’t be a live show without human beings, let what follows be a mere step across the threshold into the exploration of just how much impact the live show has on us as music fans and human beings as we all are swept away in the moment of the live show together. Music blog Stereogum revisits their favorites as bands hang from NYC’s Bowery Ballroom and the review crew gets blown away by Battles at Pitchfork, among others. Chicago Tribune rock critic Greg Kot runs down his list of top ten. We shared some of the same best of but I still wonder if we saw the same Iggy Pop show at Lolla. The Iggy I saw and heard did get scared when the crowd went nutsoid. Washington State News Tribune lists MIA, Devo, The Roots as top picks and gives Stevie Wonder the primo spot for causing goosebumps during the show. The live music crew at Popmatters slices up the live show, riffing on all the proper live rock subjects and sub-pallets. Indie-rock taste makers Pitchfork Media dish the best two ways. A staff-list photo pictorial and a readers poll. Chicago-based Concertlivewire gives the gold to the Decemberist with a list that also includes Grinderman, Wilco, Iggy Pop and Stevie Wonder. You can always count on Jim DeRogatis rock critic for the Chicago Sun-Times to go against the grain and list shows not mentioned by others i.e. Fall Out Boy, Genesis, Jay-Z and Yoko Ono at Pitchfork. With a slide show that begins with Paul McCartney and included regrouped Rage Against the Machine, The Police, Daft Punk, Interpol and Sharon Jones and the Dap Kings, this list compiled by the national Village Voice staff merges the giants with the not so giants. To sum up a lot of other lists is Harp magazine’s Tour winner: The Arcade Fire. The Toronto indie-rock collective received multiple nods from fans and writers across the globe as they toured the Neon Bible and turned cathedrals into concert venues and concert venues into cathedrals. I’ve have yet to see Arcade Fire live and I hope our path’s cross this year so I can experience what others have noted here as the best live show among all current touring bands. Other bands that made impact on audiences and made multiple top ten list and polls were: Daft Punk, The Police, Dan Deacon, Girl Talk, LCD Soundsystem and Bjork. Except maybe for the Police reunion most of these bands have a heavy emphasis on creating a propulsive and rhythmic atmosphere and have reputations for putting on engulfing live shows designed to celebrate the right to gyrate the lower regions with abandon so it’s no wonder they’re among favorites. We all still love to shake it live. 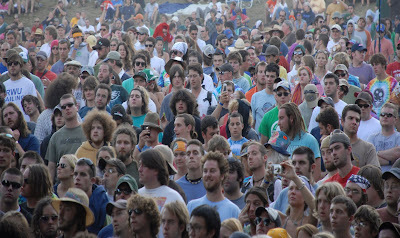 Without a doubt, 2007 held myriad moments of explosions and implosions with fans experiencing live music via the increasingly popular weekend long festivals, intimate venues and the controversial AT&T Blue Room watch-from-your-home-PC option. and who knows what this year will bring but one thing is for sure; live music is not going away anytime soon. And it’s also clear that,although popular tastes might be fragmented and diversified via the long-tail, music fans are finding a common thread of escape, self-expression and community in the live show.